Many fly fishermen believe that wet-fly fishing is a basic, boring and uninteresting technique while others consider it as far too difficult. For my part, I enjoy wet-fly fishing without being an unconditional fan of this kind of fishing method: I fish with dry-fly as often as possible and I am quite excited when a grayling catches my nymph. We used to describe the technique of wet-fly fishing in this way : using a long rod, a quite heavy fly line and a leader with three wet flies, you cast across the river. You follow the drift of the line up to your bank and if you havent felt any fish, you start the same process again a couple of meters downstream. I agree that, as described above, this kind of technique does not seem very exciting. However I assure you that reality is quite different. Wet-fly is not just fishing, it is rather a little bit like hunting: you have to track the trout, find it behind the roots of a tree, below a river bank or hiding by a rock. There is no indication to guide your casts -- no fish rising -- and you will probably not see the fish at all. But maybe you will be able to guess where the fish are; experience will eventually give you that special feel for the river waters that is the gift of wet-fly fishermen. You will have to understand very well both the river and the fish in it. You have to control the drift of the fly line and the flies, make them go near the the trouts position, at the right depth, and give them a life-like aspect. Wet-fly fishing is a three-dimensional fly fishing technique! Efficient fishing will require practice and perseverance. Casting and waiting for the trout is not enough, you have to track your prey as well. Any adequate place for a trout should be tested. 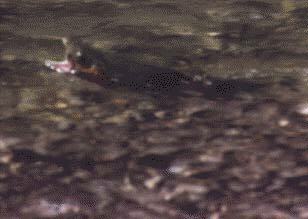 Moreover, the movement of the flies must convince the trout to attack them, which is actually a quite different (and much more exerting) activity for a fish compared with opening its mouth to catch a drifting nymph. You can however quickly learn the technique. I use my dry-fly equipment (9 feet rod -- carbon -- tip action), an intermediate or sinking tip fly line according to the river level and a leader with three flies. I choose the size and the weight of the flies depending on the river level, on the water temperature, on how deep I want to fish ... and on my mood. Short casts and a rolling movement of the wrist in the upstream direction will allow a better drift of the line, as the drift will be slower and the flies will go nearer the fish. From these basic principles, you will have to develop almost automatic procedures for guiding flies and line. Tricks and expertise are necessary to avoid "birds nests" and underwater obstacles, to find the best fly, and fish the best parts of the river, and so on. 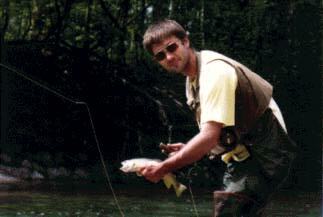 A willing trout does not hesitate very long before taking a nice-looking nymph, so do not stay for hours at the same place. Walk along the river and fish methodically each suitable place, making sure that your flies have gone, at least once, near the trouts supposed location. Then without insisting, go to the next spot. Nothing can give you more fun than luring a trout out of its hole. A special kind of "sixth sense" is required to spot the catch, to guess a fish following the flies and to strike at the best moment. Sometimes the strike is spectacular: the trout catches the fly just below the surface in a violent rush and you will probably be surprised by this "rise". On some days, on the other hand, you will see the trouts following the flies, without ever taking them ... and you had better have solid nerves. A number of entomology notions are also required. May flies, ephemerella, sedges that we use as dry-flies have a long and complex life underwater. Open your eyes wide, take a good look at your river, turn up some rocks and you will be surprised. I fish no-kill most of the time; I may take a couple of trouts home for the family but I basically enjoy catching fish. When trouts are eating underwater nymphs, why should we insist on fishing dry? I think a fisherman should be able to adapt himself to fishing conditions and find the trouts wherever they are. At the beginning of the season or when there is no apparent activity on the river, I use wet-flies or nymphs -- do not forget that 80% of the time a trout eats under water. Rod Long (more than 9 feet). The rod should be able to guide the line very precisely. A long rod help you to avoid underwater obstacles, and to work away from the bank. 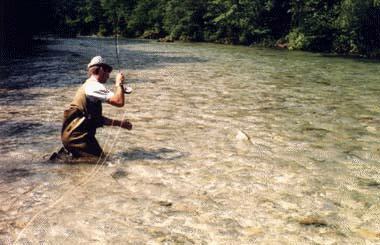 Line Intermediate or sinking tip depending on the river level or the depth you plan to fish at. e.g : Body in dubbing and tinsel, a number of pheasant fibres on the body fixed near the bend to imitate a small tail. e.g : Q couple of fibres for the tail, long body in yellow dubbing and tinsel, Thorax in dark pheasan and partridge hackles. e.g : Massive body in dubbing(different colors), tinsel, small tail and partridge hackles..
e.g : Red tag, Body in silver tinsel, leaded,brown or black squirrel tail to form the wings, some white wolve fur can be used for the throad.